While I'm enjoying writing blog posts about old projects - honestly, who knew I put so much work into the Striped Monstrosity - I do have a couple of new projects on the horizon. Since all the cool kids are doing it, I'll chat about what I have planned. First up? The Rad Redingote. 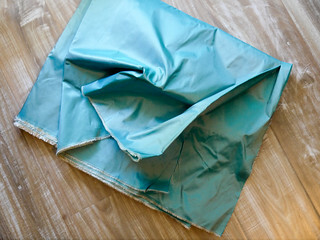 I bought this blue/cream shot silk taffeta in the fabric district during Costume College for a steal and I absolutely love it. The only problem is I only have a bit under 4 yards of it since I bought all that was left on the bolt. I want the redingote on the right in the picture above. I'm thinking that I will either have to piece or simplify the collar a bit because of how little fabric I have. Either way, I already have a sheer petticoat to wear with it and some of the silk gauze from Burnley and Trowbridge for the neck-handkerchief. The best part? I've commissioned the lovely Amy of Creative Chaos to make death's head buttons for me! Forget the rest of the dress - buttons are where it's at. My deadline is October 16th. Time to go pull out my trusty 18th century block. I'm soooo excited for this dress! You will be amazing, especially with death's head buttons from Amy! Buttons are cool but I think that fabric is where it's at!!! I hope you have enough to do what you want!